You can stop can any potential problems with your deck and fence before they even start. Quick, what do fall and winter have in common? If you guessed that they are both the colder parts of the year, you would be correct. As exciting as spring and summer are for spending time outdoors, that doesn’t mean you should make like a bear and hibernate once it gets too cold outside. Here are some of our favorite tips for keeping your deck and fence looking great no matter what time of year it is. You can stop can any potential problems with your deck and fence before they even start. How do you accomplish this? Through the cunning use of preventative maintenance. When you stick to a routine of preventative maintenance, you can spot any little problems and keep them from becoming big ones. However, when you do find something wrong with your deck or fence, it’s critical that you address them as soon as possible. Even in the fall and winter, you should still keep your deck clean. After all, rain, wind, and falling leaves could contribute to the development of dry rot, among other problems. While you don’t need to rush outside every time you see another leaf coming down, you should create a schedule where you spend time cleaning your deck and your fence. Keep your fences and decks as clean as possible, so that they’ll last longer. Don’t forget that leaves can clump and freeze, forming small puddles and piles that can always melt when the weather turns warm again. Water damage can ruin your deck and fence if you don’t exercise constant vigilance. 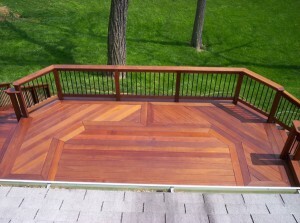 If the damage is too extensive, you might have no other choice but to replace your deck. What’s one more way to keep both your deck and your fence looking fabulous well into December? Try adding a layer of sealant to both of them. Due to colder air and less sunlight in the winter, ice and snow might not dry out as quickly as you would think. Thus, the sealant can protect your decks and fences from even more unnecessary damage. Your Deck and Fence Have Never Looked Better!